Sometimes the classics are the best, am I right? This delicious take on a BBQ Sandwich is sure to put your taste buds in their place. The game changer? The Traeger Chicken Rub, which packs a citrus/black pepper punch. Melt-in-your-mouth pork shoulder topped with jalapenos, pico de gallo, and a homemade cheese sauce. Is your mouth watering yet? The primal flavors of the Realtree Big Game Rub will enhance the authentic flavor of the meat, so don’t be shy. Shake it on there like you’re doing a victory dance. Why make plain wings when you can make Cajun Smoked Wings? These wings are so packed with Louisiana-style flavor, you’ll be licking every last finger. Pair with blue cheese dipping sauce and you’ll be the talk of the tailgate. A cheesy twist on a classic. Homemade pimento cheese adds an oozy element that’ll have you reaching for the paper towels. This burger doesn’t need a lot of topping--just lettuce and tomato. Take your taste buds for a spin and bite in. Well, I don’t know about you, but I’m ready for a feast. Head to Rocky Ridge Hardware for all your supplies (minus the meats) and get grillin’! The most wonderful time of the year is soon to be upon us. For many of us, football season holds more than just some games. It’s a time of competitive spirits, traditions that have stood the test of time, and wearing only two colors for the rest of the year. It’s a time of handing out with friends and family and comradery with strangers. It’s a time of cooler weather accompanying the taste of some delicious BBQ. Whether it’s your first game day or your thousandth game day, you know the importance continuing traditions and celebrating a victory in style. 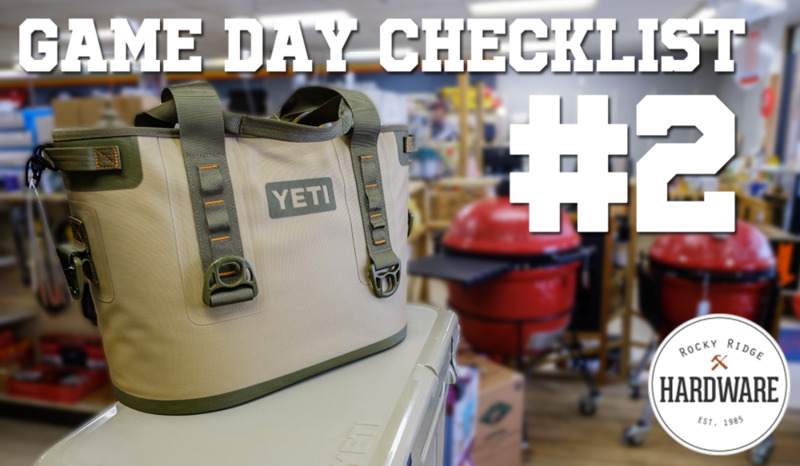 Below is our comprehensive list of the most important things you’ll need, and you can find them all at Rocky Ridge Hardware. What’s a tailgate without delicious fixins? Get started with our top-of-the line selection of grills including brands like Traeger and Kamado Grill. You really don’t want to go with any other cooler than YETI. Trust us. 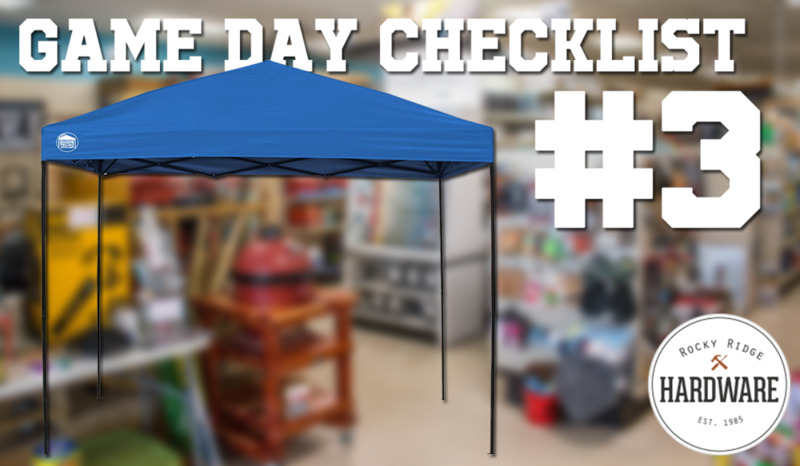 It’ll shield you from the hot sun and protect you from rain; you can’t have a tailgate without the perfect tent! If we’re being honest, food really is one of the most important parts of a tailgate. Make sure yours tastes amazing with our premium rubs and sauces. The perfect power source for your grill and the TV! It'll even charge your phone so you don't miss that victory SnapChat. We have extension cords, too! Whether you need something to keep your beer cold or your hot chocolate toasty, go with YET. Amy Howard chalk based One Step Paint is ideal for restoring furniture with minimal effort. Prep is as simple as applying Clean Slate from Amy Howard to remove any dirt and grime buildup. Let the piece completely dry, then apply Amy Howard One Step Paint. If the paint is too thick for your liking, cut it at 10%. This would be a mixture of 90% AH Paint, 10% water. For best results, use Amy Howard brushes. AH One Step is a chalk based paint with a flat finish. To apply a sheen (think satin, eggshell, semi- and gloss), use AH Clear Wax. If you are interested in antiquing pieces, use the Light and Dark Antiquing waxes with Dust of Ages to reach a desired finish – drop in for our Knowledge Bars or sign up for a daytime or evening class at Rocky Ridge Hardware. Rocky Ridge Hardware has all of the accessories needed for any Amy Howard project. Come by and talk to the experts who have graduated from Amy Howard University in Memphis, TN. Kamado’s have a significant cost. Whether it’s the $429 Junior, the $999 Classic, or the $1599 Big Joe – each is an investment. The Junior was great this summer. It was perfect for grilling for my family of 6, or smoking a good sized piece of beef. However, when trying to cook eight burgers at the same time, I knew it was time to get the Classic. The Classic was great. I could cook 15 burgers at a time, I could bake pizzas with the kids – it really allowed for any cooking configuration. It didn’t use a whole lot of charcoal and the charcoal could be reused for the next cook. However, when grilling meats for a couple of families and grilling vegetables – space ran out. I ended up upgrading to the Big Joe after getting a great deal from the manufacturer. My major concern was the cost of fuel. However, the Big Joe comes with a third heat deflector that splits the interior of the Big Joe in half. Use of the half moon deflector on the unused side of the grill effectively eliminated the need to heat up half of the grill. What does this mean for the consumer? Time and time again I come across people who own three or four Big Green Eggs, to accommodate all their cooking needs. I have also heard a few horror stories of rusted out BGE’s. I do a little math and think about the KJ Big Joe. In one unit, I am able to double the cooking capacity of the largest BGE. Added benefits include being made of superior components and including all needed tools in the purchase price. It’s a win in all areas. When you’re used to spending 40 cents on a traditional, incandescent light bulb, the $5-$10 price tag on LED bulbs might make you hesitate. That is, until you realize that you will use approximately 25 traditional bulbs over the lifetime of just one LED bulb. Add to that the fact that it costs almost $5 per year to run an incandescent bulb compared to about $1 per year for an LED, and the choice now seems much more clear.